But as the world—well, most of it—races to fight the threat of climate change, Mazda, like every carmaker, must find ways to crank up the efficiency of its lineup in order to satisfy the demands of global regulators and green-minded consumers alike. Electric cars may prove cheaper to build than internal-combustion ones in the end due to their mechanical simplicity, but switching from a lineup of fuel-burners to electron-powered vehicles is in and of itself a vastly expensive proposition—one Mazda lacks the national GDP-esque budget to pull off easily, even with the help of Toyota to develop electric car tech. So, instead of pulling a Volkswagen and spending billions to go all-in on building a giant fleet of EVs (and their accompanying charging network) from the ground up, Mazda is looking to squeeze a bit more life out of the internal-combustion powerplant. Enter: Skyactiv-X, the company's new generation of efficiency-minded ICE technologies. The new system is part of the company's bold, comprehensive efficiency strategy strategy that places a priority on reducing overall well-to-wheel emissions—to 50 percent of the brand's 2010 levels by 2030, and 90 percent of said 2010 levels by the year 2050. Indeed, Mazda claims future versions of its Skyactiv tech will be advanced and efficient enough to equal electric cars on said well-to-wheel emissions, thanks in part to features like a (theoretical) thermal efficiency of 56 percent—which means only 44 percent of the energy in the combusting gas is lost as heat. But that's all a bit down the road. In the meantime, there's Skyactiv-X. Mazda says the new engines will arrive in 2019 (the company isn't being more specific than that), and while representatives wouldn't specify in which model it would debut, they suggested a quick examination at the lineup would suggest which vehicles were due for the hefty changes likely to go hand-in-hand with an all-new engine. Here's a hint: Look towards the top right. Chalking up a significant gain over that, however, meant going a few steps further. With all the "easy" routes to a more efficient engine taken, the company was forced to reexamine the ways in which gasoline blows up inside a cylinder. So, much like a man whose holiday eating habits have left him feeling gross, Mazda decided to get lean. To put it somewhat simplistically, gasoline engines normally aim to have what's known as a stoichiometric mixture of air and fuel, where it's easy for as many gas molecules as possible to find oxygen partners to the combustion square dance. Moving to a leaner fuel/air ratio than that, though, offers a few benefits; that extra air means it's cooler inside the cylinder, as the extra oxygen soaks up the heat—and since it expands as it heats, it helps create pressure, adding to the force pressing down on the piston that creates the mechanical energy that ultimately moves the car. Because it’s cooler, less energy is wasted as heat, thus upping thermal efficiency. But there's a reason most carmakers don't run their engines lean. With those gasoline molecules so comparatively sparse, there's no guarantee that the chain reaction kaboom inside the cylinder will occur with the reliability needed. As a result, engines running lean usually wind up having to work harder to keep the fire burning, thus offsetting the gains that come from over-oxygenated combustion. Unless, of course, you switch to compression ignition like diesel engines use, which pushes the gas molecules closer to one another and heats up the fuel/air mixture high enough that it blows up without the help of a spark. (It’s also faster than spark ignition, so it can extract more work from the same amount of energy—thus boosting efficiency, and creating the higher amounts of torque that diesels typically offer.) 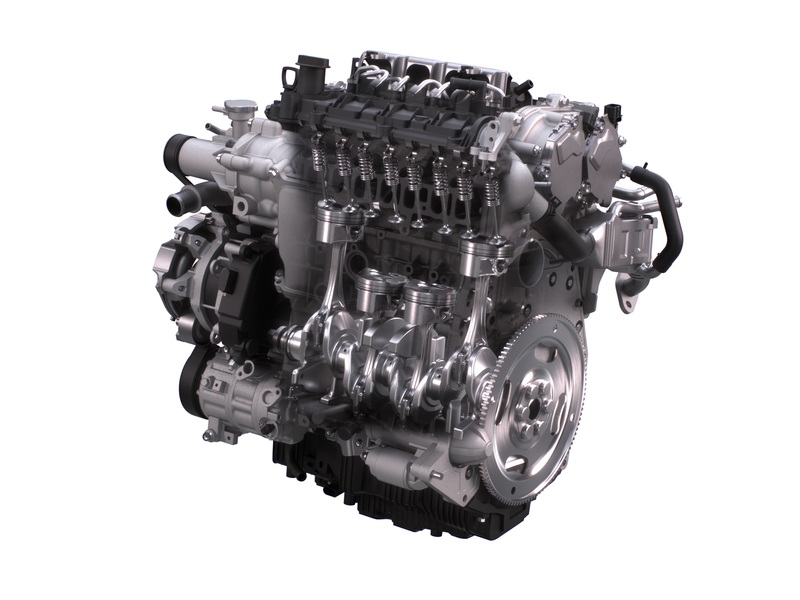 Trouble is, the design of a gasoline engine makes it hard to control conventional compression ignition; while diesels blast the fuel into the cylinder at the moment they want ignition to occur, a gasoline engine already has the fuel inside the chamber as the mix in the cylinder compresses. 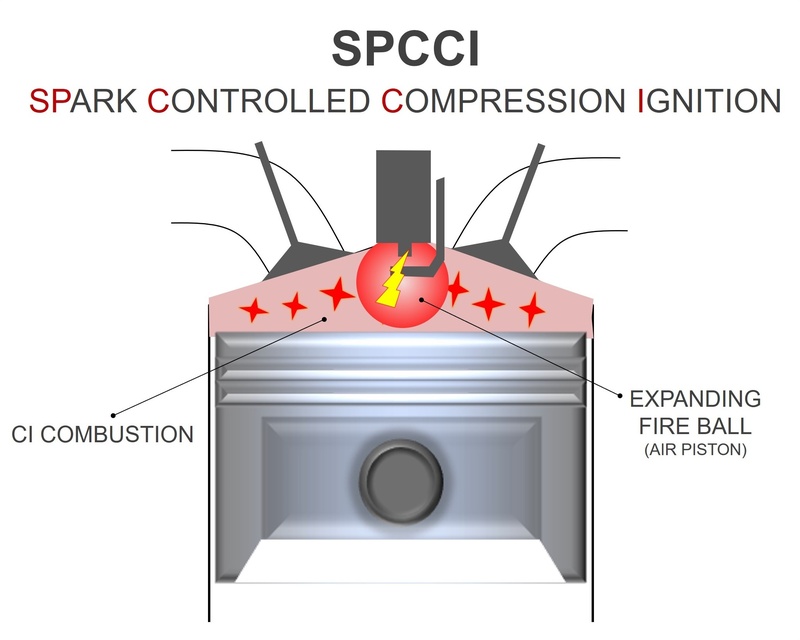 So Mazda came up with a clever hybrid solution: spark-controlled compression ignition, or SPCCI. In SPCCI, the engine is designed to compress the fuel/air mixture to a bit below the threshold where compression ignition would occur (to a 16:1 ratio in the Skyactiv-X engine, specifically), then kick off ignition with a small spark—just enough to ignite a fuel-dense area, creating a tiny fireball…which, in turn, pushes outwards against the rest of the fuel/air mix, raising the pressure to the point of compression ka-blam. But how do you get that fuel-dense area at the top of the cylinder for the spark plug to start things up with? Well, in Mazda’s case, they designed the cylinder to create a swirling vortex inside, where the central area—the eye of the storm, in hurricane terms—contains a higher level of gasoline vapor. They also implemented a split fuel-injection strategy, in which just a small amount of gas is spritzed in during the intake stroke, then a larger amount is shot into the cylinder during the compression stroke. But even the best-laid plans of mice and engineers can go astray in the real world; outside factors like air pressure and humidity can change the moment that compression ignition occurs. 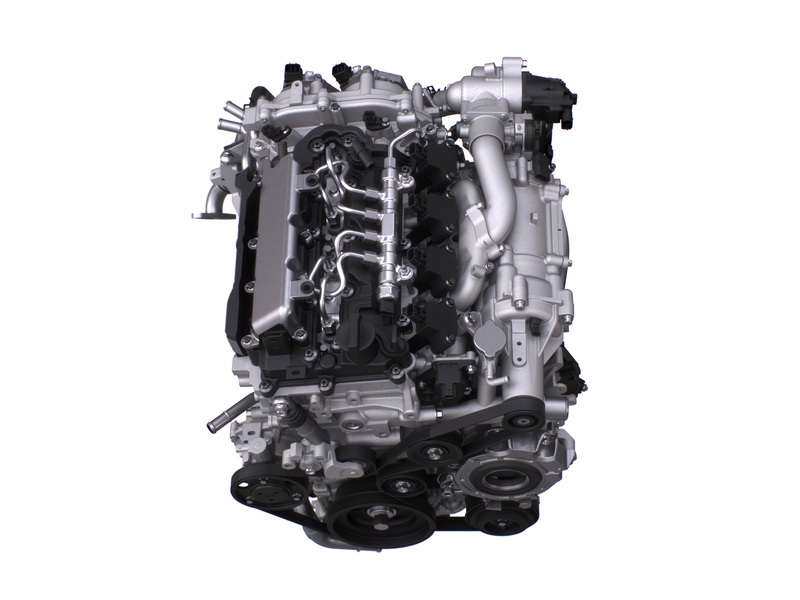 The Skyactiv-X engine is designed to counteract this by constantly adjusting the ignition timing through every combustion event; in addition, a small supercharger helps control the pressure of the air flowing into the engine. The end result, Mazda says, is not just a more efficient engine, but one better optimized for the way most people drive. Skyactiv-X is designed not only to offer greater torque at low rpm than the company’s previous engines, but also to be more efficient while doing it. And during times of truly heavy load—under full throttle acceleration, for example—the motor switches over to conventional spark ignition, to make sure peak power is still there when needed. The ultimate goal: to create an engine both noticeably more powerful and more efficient than the current Skyactiv-G motors. 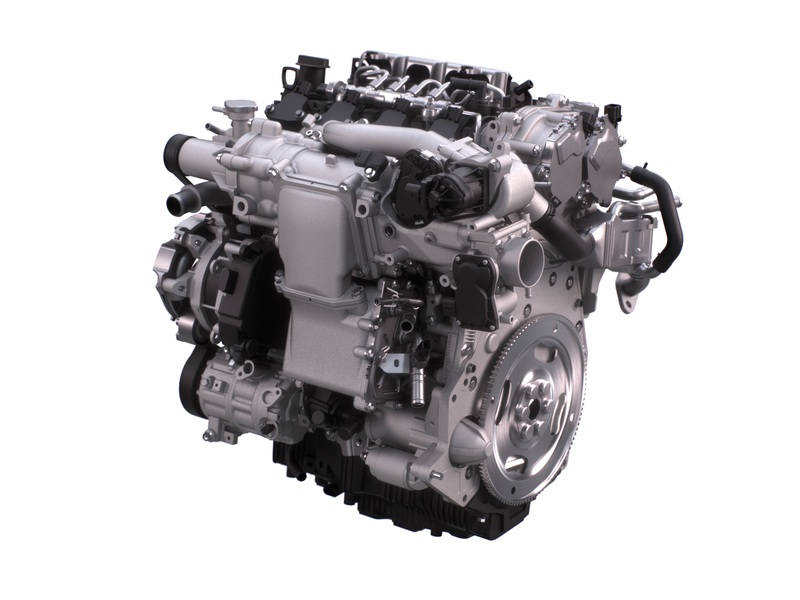 The 2.0-liter inline-four that's expected to serve as the launch vehicle, so to speak, for Skyactiv-X makes roughly as much power as the 2.5-liter four-pot (which makes 184 horsepower and 185 pound-feet of torque) found across much of the model range...but with 20 percent greater efficiency than the current 2.0-liter that the EPA rates at 37 miles-per-gallon highway in the Mazda3. So, an engine that can propel a (very nice) compact car from 0 to 60 miles per hour in about seven seconds flat...but still gets just shy of 45 mpg on the open road. 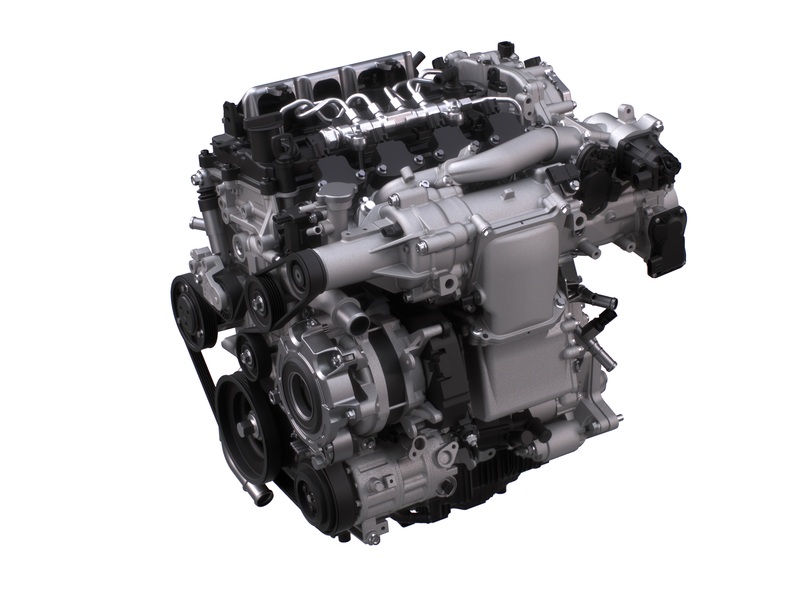 In addition, the engine's power band produces better fuel consumption over a wide range of rpms and engine loads—particularly in contrast to downsized turbocharged engines, which usually offer a narrow region of optimal fuel economy (**cough cough EcoBoost cough cough**). This allows Skyactiv-X-equipped vehicles to use lower overall gearing than competitive vehicles with more traditional engines—which, of course, produces quicker acceleration and peppier response. All of which is great, on paper. But talk is cheap, especially when it's the kind of self-congratulatory praise being fired at members of the media by PR reps. So to prove Skyactiv-X is more than just vaporware, Mazda set a group of journalists loose in a handful of next-generation vehicle prototypes packing the 2.0-liter version of the SPCCI-equipped wonder-motor. The engine felt largely unremarkable—which, given the work-in-progress nature of the prototypes, is far more complement than insult. A tablet mounted high in the driver's eye line provided information as to when the engine switched from SPCCI operation to old-school spark status; for the most part, it stayed in compression mode, only straying into traditional ignition when your humble author decided to drive like the lead-footed maniac he is. A bit of knock (which is simply unintended compression ignition) was apparent from time to time, particularly in the stick shift car, where the ECU had less control over the engine's speed than it did in cars with computer-controlled gearboxes. But apart from that, the small engine proved more than capable of hauling around the compact car prototype with the verve of a reasonable four-cylinder engine. The demo vehicle felt a mite less responsive than a 2.5-liter Mazda3 5-door the company loaned yours truly for the commute from our Laguna Beach hotel to the automaker's R&D HQ in Irvine, but that could have been due to anything from irregularities in the test engines to the fact that the prototype was laden with three full-grown men. Unfortunately, the true test of Skyactiv-X—how efficient it is—remains a big question mark, as Mazda didn't tell us what sort of fuel economy figures we racked up during our brief drive routes around Orange County. Given the discrepancies that can occur with prototypes as complex as this, it's hard to fault them—but it also means the test drive wasn't nearly as informative as it might have been. Still, even those short drives were enough to demonstrate just how serious the carmaker is about modernizing and revolutionizing gasoline engines even in the face of the onrushing EV revolution. Will Skyactiv-X be able to deliver on the promises Mazda has made? We'll find out next year...but if the engine can even deliver half of the efficiency and drivability gains the company expects, it seems likely the Mazda buyers of tomorrow will be pleasantly surprised both when they hit the gas pedal and when they hit the gas pump.